We know what readers are doing on our sites. What we need to know is why. Some Facebook users were outraged this summer when they learned that the world’s biggest social network had, during a week in 2012, manipulated their emotions by tweaking its News Feed algorithm. Researchers showed some users mostly upbeat posts, and others only depressing updates. The result? Those with happy News Feeds posted more positive things, and the negative feeds prompted more bummer posts. When news of this willful audience manipulation broke, users were shocked. “Facebook Totally Screwed With a Bunch of People in the Name of Science,” read a Time headline. A senator even asked the Federal Trade Commission to investigate. It’s as if we want the bots to understand us, but also to indicate somehow that they can never fully understand us, that we are more than a collection of clicks. This has always been a tension in journalism: Do we exist to give readers what they want, or are we here to tell them what we think is important for them to know? Who’s driving whom? In the pre-internet days, this was mostly a topic of conversation among editors behind closed doors. And the answer, at most mainstream news outlets, at least, was that journalism exists to give readers both what they want and what we think they need. Some things of no news value made their way into the paper just because readers liked them (the crossword, the comics, recipes for ranch dip), and others were there mostly because editors deemed them important (coverage of wastewater-treatment meetings, wire reports on conflicts in tiny African nations). Save for the occasional piece of service journalism, most of the pure reader-bait didn’t make it anywhere near the front page. The business model meant that it didn’t matter—subscribers were all buying the same package of content. And if readers had opinions about the hard-news content, they were free to write a letter to the editor. Mostly, readers’ desires were an abstraction. Thanks to data and analytics, readers’ desires—by which I mean their clicks—are now of concrete importance. News outlets can see exactly which consumers are coming to them, and for what. In theory, they can use that information to convince advertisers to spend money on them, and to keep even more readers coming. In order to do that, though, they must consider the search engines and social-media networks those readers use every day. Editors have been tailoring headlines to Google’s needs for almost a decade. The homepage, traditionally thought of as the A1 of a news organization’s digital presence, is increasingly irrelevant as more and more of those readers come in through the side door of article pages, having followed links from social media. Very few readers get the total package anymore. And so even on an editorial level, our understanding of audiences, and what motivates them to give us their time and attention, has never been more important. 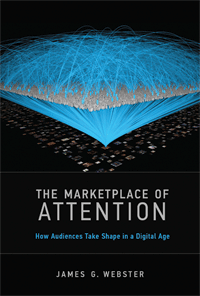 In The Marketplace of Attention: How Audiences Take Shape in a Digital Age, James G. Webster, a communications studies professor at Northwestern, takes an exhaustive look at the research about how such audiences form. Or rather, how audiences are formed. It’s tempting to focus on what readers say they want, assuming their decisions are based on those desires. What Webster argues quite convincingly is that even if users do have some idea of what news and information they want (and it’s not entirely clear they do), they don’t know how or where to find it. And they might not have the time to figure it out. So users are more susceptible to the manipulations of algorithms and the biases of their social networks than many would like to believe. People make “pull” decisions—seeking out news about their favorite football team, or the latest from their favorite op-ed columnist—but also can be “pushed” into consuming media. Outside the digital realm, this can mean bundling hard news with soft, or scheduling a new sitcom in between two already popular shows. Online, it often means encouraging clicks with lists of suggested articles and other algorithmically fine-tuned prompts. An audience, in other words, is not something that exists on its own. It must be constructed. If people aren’t presented with an easy way to keep up on the news from Gaza, they’ll default to clicking on quizzes and checking sports scores. But for journalists, even those who care about clickability and search optimization, the “why” matters. Many people tell researchers that they care about current events. Or tell their friends they’re sick of wasting so much time on Facebook. Or that they wish they knew more about the situation in Gaza. They just don’t know how to change their habits, or where to begin sifting through the mountains of information available online. “People rely on shortcuts to simplify choice making and often, when they do, they open the door for push media to reappear,” writes Webster. The possibilities of “push media” are interesting for journalists. Telling users that something is already popular is a pretty good way to get them to click on it. Research shows that when people are given a list of bands they don’t recognize, they gravitate toward those that other users are listening to. Which is why digital media staples like the “Most Read List” are so appealing. “These measures don’t stand apart from the reality they purport to measure,” writes Webster, “they reshape it.” Some sites have experimented with a list of “Editor’s Picks” alongside “Most Read.” But it’s far more common to see something along the lines of what The New York Times offers. Its sidebar lists are “Most emailed,” “Most viewed,” and “Recommended for you.” Our fellow readers and our past decisions (thanks to an algorithm) are doing the recommending, not a human editor who’s trying to tell users what’s most important in the news today. (Sure, we could find that on the homepage. But most readers don’t ever make it there.) Could there be an algorithm that accounts for news-worthiness as much as our fellow readers’ choices? Or would such a move by a news organization incite the sort of backlash Facebook was met with when it tried to manipulate users’ happiness? “Ad-serving companies like FB love pre-emptive personalization because they believe they can shape you into who they want you to be,” tweeted The New Inquiry’s Rob Horning, in the wake of the Facebook feed-manipulation news. Maybe not the person they want you to be, but a version of yourself that is indeed marketable. We’ve all had the experience of being reduced to a market segment. And usually, it’s frustrating. How dare Facebook assume that, if we change our relationship status to “engaged,” we want to see ads for white frilly wedding dresses. Why doesn’t Netflix understand that, just because we have a nostalgic love for Twin Peaks it doesn’t mean we want to exclusively watch homicide procedural dramas? We’re angry when the algorithms get it right and also when they get it wrong. It’s as if we want the bots to understand us, but also to indicate somehow that they can never fully understand, that we are more than a collection of clicks. “Even the most sophisticated algorithms and mining the biggest of big data have a way of reducing multidimensional people into simplified models of themselves,” writes Webster. But what if news organizations allowed readers to play a role in creating that model? In the past, hard news was bundled with TV listings and travel tips. At the bottom of article pages now, many media sites already offer a link to an article to read next, or simply begin the next article. If outlets offered users the opportunity to tweak their own algorithm, I wonder if that would alleviate some of the frustration users feel when they realize they’ve wasted an hour on clickbait? What if, for instance, the Times or BuzzFeed allowed us to express a preference for reading a dispatch from Sierra Leone or an update about the federal budget after each “Modern Love” column or listicle, reflecting the way content is bundled in the print publication? What if Netflix reminded us that we’ve watched only reality-TV reruns without dipping once into the documentaries in our queue? Rather than complaining about the proliferation of clickbait, journalists should understand that their audiences’ high-minded desires don’t always align with the choices they make—in part because those choices are nudged by algorithms and popularity. The wealth of information has made editorial judgment more important, not less, because consumers need help to find what’s important and relevant to them. If they aren’t presented with an easy way to keep up on the news from Gaza, they’ll default to clicking on quizzes on checking sports scores. They need our help. By now we’ve all heard of the “long tail” theory, which holds that traffic to the biggest sites absolutely dwarfs the majority of sites on the Web—sites that have no chance of ever becoming big enough to compete with the existing behemoths. Popularity breeds popularity, and the top 20 percent of websites eat up 80 percent of the traffic. When researchers studied news stories that dominate mainstream media—those bigger sites not relegated to the long tail—in only 3.5 percent of cases did the stories percolate up from blogs and smaller sites. In most cases, the news moved down the tail. In other words, sure, there are no barriers to creating things and putting them online, but the digital realm is far from the meritocratic utopia many hoped it would be. If a post falls on Tumblr but no one reblogs it or tweets it or links to it, does it make a sound? Obviously not. The real question is, should we care about the fact that no one’s listening? These days, the “Field of Dreams principle”—if you build it, they will come—is as dated as Kevin Costner’s career. When it comes to getting a large number of people to read or see something online, the barriers are often as great as they were in the pre-digital era. “Quite often, audience-building involves a more calculated effort to optimize search-engine rankings, exploit the flow characteristics of existing media, target specific messages to specific audiences, or marshal the publicity machines of major studios and publishers,” writes Webster. This is a view that’s tough to get from data that are dispersed across different websites and outlets and formats. Even though every news organization is working in a highly networked digital world, it’s the sort of thing we need researchers and academics to remind us of. Each media outlet only sees who’s clicking on its articles, never a full picture of a user’s behavior. And even if an outlet can afford the sort of analytics that allow those users to be grouped into valuable target-advertising segments, such data will never reveal motivations. Which is why it’s perhaps worth asking those people directly—the loyalists who are already in the audience—what they’re interested in seeing more of. Then combine that information with data on what they actually click. Webster notes that at outlets as diverse as PBS and Fox News and Comedy Central, about 20 percent of users account for about 80 percent of viewing activity. Many publications are already trying to turn this core group of users into paying subscribers, but perhaps it’s also worth appealing to their high-minded desires. Digital tools like popularity and search algorithms are designed to appeal to the 80 percent of users who are casual consumers. But journalists—especially those at smaller outlets—would do well to keep the needs of their smaller, loyalist audience in mind. Chances are, those readers are just as frustrated with algorithms as editors are.